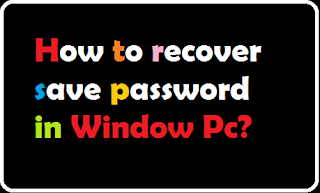 Home» Window » How to recover the save password in your Windows PC? Hello friends In today's topic, you will learn how to hack or recover the save password in your Windows PC? You know that many passwords are saved in your local computer, such as wifi, email, gamil facebook etc. Today does not have any time with anyone that he repeatedly login his id, you save the password in a hurry, you do not know that the password can also be retrieved, like you forgot a password So there are many tools available that can be used to recover the password. And your password can be traced. Guys All save password can be hacked . If you also want to hack your Windows PC or your friend's password, then read this post to the last, you can easily hack someone's password. Warning: only for educational purpose, we are not responsible for any illegal work done by you. Step1; First of all you will need a tool, the link to that tool is given below. Click the link and download the " LaZagne " tool. Step2; After downloading the lazagne tool you will find this tool in the zip file, extract zip file on your pc, and you can use the WinRar tool to extract the file. Step3; Now where you extracted the lazagne tool, go to that folder, and run that tool from the command prompt, to run the tool, where you extracted the file in your pc, in the address bar at the top By typing "cmd" and pressing Enter key If you do not understand, then definitely see the given screen shot below. Step5; Now you will see that file you have in that tool will appear in front of you, you can execute the file "laZagne.exe". To execute it, type at the command prompt "laZagne.exe" and press Enter. Step6; Now you will have many options in front of you, whatever type of password you want to recover, then in the same command prompt window you type "laZagne.exe wifi" and press Enter. Friends, here I have recovered my WiFi password, in your case it can be something else. Note “LaZagne.exe wifi” laZagne on here And there is space between wifi. If you have to see all the passwords in your computer, type the following command and hit enter. Friends will see that the process has started, the list of all the password will be saved in your computer. You have successfully retrieved all save passwords.